T-Mobile has lots of 600MHz LTE smartphones and a couple of 600MHz LTE tablets, but today it’s launching its very first 600MHz-capable mobile hotspot. The Coolpad Surf is now available from T-Mobile. Pricing is set at $0 down and $3 per month for 24 months, or $72 full retail price. With the Coolpad Surf, you can use T-Mobile’s 4G LTE network to spit out a Wi-Fi connection that supports up 15 simultaneous connections. 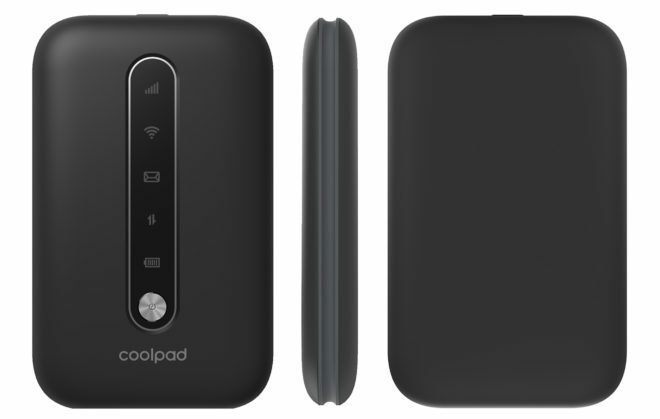 Coolpad’s mobile hotspot supports 4G LTE bands 2, 4, 12, 66, and 71, as well as 3G bands 1, 2, and 4. It includes a 2150mAh battery that offers 5.3 hours of usage time or 48 hours of standby time and recharges using microUSB. It’s also got LED indicators and a control panel that offers important stats, like battery life. It’s good to see T-Mobile grow its 600MHz device selection with a new mobile hotspot device. While most smartphones can also function as a mobile hotspot, a dedicated hotspot device can still be useful for folks that regularly need a hotspot connection. When you’ve got a mobile hotspot device, you don’t have to drain your smartphone’s battery to get your other devices online. Does a dedicated mobile hotspot with 600MHz LTE support interest you? It’s a $70 hotspot. Give it away when 5g comes out. Back in 2010 a clear wire WiMAX ispot hotspot was $100 or $225 as a regular WiMAX version. . Complain about that wasn’t future proofed. the main LTE bands to check are. ugh. those prices are jacked especially since the loss of BINGE ON services. $85 and only 22GB’s, screw that!!! On a dedicated stand-alone hotspot? Hotspot data is also always further deprioritized, even on post paid. Install a VPN. Tmo wong be able to tell. I have that international plan on 2 lines when was $25 but the tos 50% has be on device really dont let u use it like a dedicated hotspot. It just in TOS dont mean they will do anything but they do have the option 2.I just waste data on device over hotspot data so im within the TOS. Check my other replies here. Tmo has an unlimited hotspot feature for phones for $50. Philly is a very small part of the United States! This should be priced the same as any tablet you add to your T-Mobile one plan. This should be twenty dollars for up to 50 gigs or maybe 20 gigs. It shouldn’t cost more then an existing tablet or wearable added to your one plan. . No thanks. Can this run in bridge mode? I want something I can connect to a router. Or a usb modem I can connect to my, funnily enough, TMO cellspot router (Flashed to stock firmware). Currently using a huawei and works fine, though wish I got faster speeds. You can get an unlocked Netgear Nighthawk M1 and use your t-mobile sim in it.The speeds should be ok and i believe it supports most of t-mobiles bands minus 71 of course. I have a 6GB free line on us plan with unlimited video streaming, if i put that sim card in this hotspot will my netflix and YouTube streaming still be unlimited? Hi,TmoRep,I ask this question before not one person ever reply back. Hoping you will. What does Tmo,do with all the phones that get return to them? Ever time I go to thier site look under refurbish phones,they have none,or very few. So what does Tmo do with them? Thank you. Sam, if it is a mobile internet plan, yes. I have one that’s 5gb and it doesn’t use my plan data. If it’s a phone plan, it won’t work. So isn’t it like $25 to just get another phone, and use it to tether 10 gigs for free vs paying $40? I seem to have gotten in on a deal where they offered high speed hot spot with the Tmo One – so this seems like the logical choice to me. i think you’re referring to the postpaid AAL on t-mobile ONE – which only includes unlimited 2g tethering. The current offering for high-speed tethering is T-Mobile One Plus ($15 extra) which includes 20GB of tethering, so 40m or $35m with autopay. so yeah, probably a better deal. I got in when they offered a special deal so it is different. But to your point yeah $15 for tethering on the phone on the current plan is a lot cheaper than getting this LTE hotspot. Yes it is. The only downside is having to use your phone/battery for it. Not many people know this, but tmo still offers UNLIMITED tethering for $50 and it includes almost every feature tmo offers on top of the UNL tethering. I used a phone for my whole apartment before. You just keep it plugged in for hotspot mode. For tethering you should be able to get 10watts from your computer which is enough to keep the phone charged. Asus wifi routers have software built in to allow tethering from a phone (use a VPN as well – it may extend the amount of data you can use) other brand Wifi requires custom firmware be flashed to get tbis feature. Actually, all tmobile One plas include unl 3g tethering, not 2g any more. I believe its 512kbps but it’s almost always much faster than that for whatever reason. I’ve had several customers tell me that they’re able to game and stream using the free “3g” hostspot. One+ for $15 will get you 20gb LTE hotspot, or $50 for UNLIMITED 4glte hotspot. The $50 is called one+ global and comes with tons of other international features. It basically includes every extra feature Tmo offers for the $50. It used to be $25. I have an extra dedicated line I leave at home with the UNL hotspot that is literally my home internet. It works perfect! Every so often they will have a special where they offer full LTE for 10gigs or so of data before throttling – but yes basic plan is 3g speeds. They switched One Plus tether throttling from 128Kbps to 512Kbps in 2016, the latest support docs say 600Kbps though. Wow I’m also a rep and didn’t know that. Awesome! Lol those hotspot plans are a joke. Even Verizon is becoming more user friendly by giving unlimited hotspot for $65. I’d rather pay that than $85 for 22 GB.. Plus, Verizon has a more superior network. Nice try T-Mo! Unlimited hotspot on a stand-alone hotspot device other than your phone? I should buy Verizon for my home internet then and drop Comcast. You can get unlimited hotspot on a T-mobile phone for an add of $25 per month. What’s the hotspot device called? Verizon only sells the jetpack. Just look on their website. Two models. The $49 one is available. The $199 one is sold out. 3GB for $35, 15GB for $45, unlimited GB (throttled at 22GB??) for $65. He’s confusing voice data lines for hotspot lines which this post is about. He’s clearly confused. It’s used to be $25 for unlimited hotspot on tmo. Its $50 now and they bundle it with a ton of international features. It’s called one+ global I think. Please have correct information before you post for others to see. Because $85 for 22gb is a lot better than $110 for 20gb. Hey Donkey, what you’re looking at is Verizon prepaid voice lines not stand alone hotspots. Prepaid plans aren’t eligible for 4g LTE hotspots, it clearly says on their website. Stop posting false information. So, I have a question: I have one of T-Mobile’s hot-spot devices that plugs into my car’s OBD port, the Sync-Up Drive, is this device not capable of using Band 71? T-Mobile has deployed their Band 71 everywhere around here and coverage is great, but the performance on this OBD device is dismal to put it mildly, so I’m wondering if it is only good for Band 2 or 4 or something else? I don’t believe the Sync-Up device supports 600 MHz. They will probably release updated hardware in the near future. I kinda doubt that ZTE will be making any new versions of this since ZTE is one of the Chinese companies that Trump wants to get or keep out of the US. They came very close to going broke last year because of those efforts. I am not surprised that the performance is dismal. Hey lets put a radio device into a steel cage which reflects all signal and see how well it works. Its not like just putting your phone on the seat – under the dash – isnt isnt signal friendly. I found a ZTE (who makes the SyncUp Drive) website that lists the bands this device supports and they are 2, 4, 5 and 12 for LTE and 1,2, and 4 for HSPA. Band 71 is not supported as I suspected. The device works just fine on the bands it supports, but T-Mobile only uses Bands 2, 4, and 71 here, so you need a device that supports Band 71 for good long-range service. Therefore, I will be taking my SyncUP Drive back to T-Mobile and getting one of these new Coolpad devices. I was interested in this until I saw the ridiculous amount they are charging. No one offers a sensible mobile data plan they are all absurd and limit you and charge too much. I am considering switching to Verizon, since tinyhouse living means you cant really get real wireline internet… Streaming VUDU for 6 hours a month will blow through my tether data. Verizon has better coverage, and they have unlimited tether(drops to 600kbps after 20GB). A better deal than T-Mobile since it’s technically unlimited(just throttles to lower speed). *One Plus plans drop to 600Kbps after 20GB just like Verizon. There’s also a $50 global add-on with truely unlimited tethering. *The older grandfathered Simple Choice Unlimited plans drop tethering down to 128Kbps after you’ve used your allotment but you can stream unlimited SD video via tethering without touching your data allotment and even after you’ve exceeded your allotment with Binge-On enabled and music streaming also doesn’t touch your data. These plans are overpriced for 2019. I do not believe this device will be a success. Ridiculous data vs pricing tiers. At $85 it should twice the data of 22GB that’s being offered. At least twice. That’s for phone data. I am talking about hotspot data, which T-Mobile shuts off at 15GB unless you buy more top-ups. For phone data, Verizone throttles at 75GB. .
75GB is only for Verizon’s highest tier. You can be deprioritized at any time with it’s lowest tier, after 22GB for it’s medium tier, and after 75GB for it’s highest tier. T-Mobile is just after 56GB, period, for all it’s plans. P.S. You’re talking about deprioritization, not throttling and deprioritization is not the same as throttling. There is no set maximum speed for deprioritizationy (you’re just able to use less resources than non-deprioritized users) and you’re only deprioritized if there’s high congestion at the site you’re connected to. If you connect to an uncogested site or the congested site becomes uncongested, then the deprioritization stops. It’s extremely unlikely that an user will be deprioritized and even if they are, it’s unlikely that they’ll even notice a difference. Throttling on the other hand sets a maximum speed all the time. I’m assuming the available data per tier is a soft cap and once I exceed my specific cap, I can continue to use as much data as I want, but will potentially be throttled…. Or are these hard caps and once I use the 2GBs that’s it I can’t use any more data for the rest of the month? Or would I automatically get bumped up to the 6GB tier and have a $25 bill at the end of the month rather than a $10 bill? Do the plans include roll-over data? If I only use a gig, will I get 3GB for $10 the next month?